Does he gain an Icon of each type for every icon on each INDIVIDUAL character card in the discard? In the other words, if two characters had a skull each in a players discard- would he also gain two skulls, or he would he gain just one skull because there's a skull on a character card in a players graveyard? 2- Really basic question here- but can Invulnerable character be "Destroyed" through card effects? Are they just Immune to Wounds, or can cards like "Concrete and Chains" destroy them? So in your example, Malocchio would only gain one Combat icon. So in your example, Concrete and Chains could indeed destroy a character with Invulernability - even an Ancient One! Also, if you use it on a Fated character (or someone with a similar ability like Nikola Tesla) who already has some success tokens from their own ability, then those pre-existing success tokens would also reduce their skill by -1 each and hasten their demise. Thank you very much for your swift response! To keep going with the Tokens discussion- would a fated character go back into the deck before if it destroyed if it ever has three tokens on it? Alternatively, can Nikola tesla's tokens gained through concrete and chains be reassigned to stories as success tokens? What about Wilbur Whateley? Does he count as a won story card BEFORE he is destroyed? After all, succeeding at a story is instantaneous and precedes all other effects. Concrete and Chains specifically would resolve before Fated X, and the character would be destroyed. For other effects like Summon Spectral Hunter, the active player would decide the order of conflicting passives and could choose Fated X to trigger first. Alternatively, can Nikola tesla's tokens gained through concrete and chains be reassigned to stories as success tokens? Absolutely! A success token is a success token, no matter how it was placed on Nikola Tesla. What about Wilbur Whateley? Does he count as a won story card BEFORE he is destroyed? After all, succeeding at a story is instantaneous and precedes all other effects. Concrete and Chains only checks its condition at the start of each player's turn. 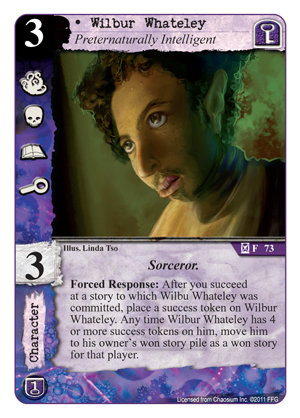 If Wilbur receives sufficient tokens (generally 3) to reduce his skill to 0 at the start of the turn then he is destroyed. However if he somehow gains 4 tokens outside of the start of the turn then he will become a won story. Great questions. The rules actually don't specify the timing or speed of the Fated X ability, but I consider it to be a passive effect. 4. Passive abilities (requirements now met) are initiated. on it, place that card on the bottom of its owner’s deck.") is a 'b)' because it occurs when its condition is met. Concrete and Chains passive effect ("Attached character gets –1 skill for every success token on Concrete and Chains.") is an 'a)' because it applies whenever another player or game effect performs a skill check. Note that Concrete and Chains' "... If attached character has 0 skill, destroy it." effect is NOT a passive effect, but is part of the Forced Response, and is only checked when the Forced Response triggers "At the beginning of each turn ..." after you "... put a success token on Concrete and Chains ..."
1.1) At the beginning of a turn, Concrete and Chains' Forced Response would trigger, and the first effect of placing a success token on the attached character is initiated and executed. 1.2.ii) Concrete and Chains' Forced Response second effect now executes, and if the character is at 0 skill (or less - which is also considered to be 0 skill), then they are destroyed. 2) After resolving the Forced Response, passive effects like Fated X could initiate - however in this instance it is too late as the character is already destroyed in the previous step. Note that it is a different story with Fated X and Summon Spectral Hunter. Summon Spectral Hunter's passive effect first part ("Attached character gets -1 skill for each success token on it ...") is an 'a)' because it applies whenever another player or game effect performs a skill check. Its passive effect second part ("... and it is destroyed if its skill is 0.") is a b)' because it occurs when its condition is met. 1) At the beginning of the attached character's owner's turn, Summon Spectral Hunter's Forced Response would trigger, and the effect of placing a success token on the attached character is initiated and executed. 2) After resolving the Forced Response, passive effects like Summon Spectral Hunter's second part and Fated X could initiate. As these both wish to trigger at the same time, they are considered to be in conflict, and the active player - the attached character's owner - chooses the order of resolution. If the owner chooses Fated X to resolve first then the character will be placed on the bottom of their deck, otherwise if Summon Spectral Hunter's ability is chosen then the character will be destroyed instead. Thank you for the answer- I haven't checked this board in a while, but I really appreciate it!